SPECIAL SALE - Share Your Unique Ideas to Win 10% OFF of Completely Custom Wedding Cake Toppers. 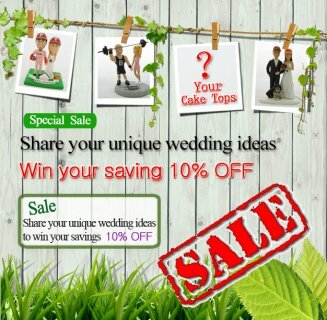 If you have some unique ideas about cake toppers which are different from those on our web site and also you are willing to share your ideas, you can get this discount. You design It, We will make It! You design your layout, We will make your special figurine with Hand Sculpted & Hand Painted Figurine based on your design! Customize the bride and groom dresses, smiles, hairstyles, etc … in a 3D memory. A unique gift for the bride & groom, and for the wedding occasion that nobody will forget. Using your photos and your special design as references, our professional sculptors can create custom figurines made to look like you or your love one! Upload or Email your images and designs in mind or ANYTHING YOU WANT and we will work together in handcrafting the special moment only unique to yourself and your beloved! NOTE: Choosing this cake topper stands for you are willing to share your ideas of cake topper. That means we have the right to use your photos for promotional purposes. We guarantee your photos will not be sold, rented, or exchanged for benefits to other companies. You can get 10% off and be served by our best sculptor. We really appreciate your participation. Important: Making good cake toppers depends on good photos so we strongly recommend you read our Photos Guidelines before uploading photos. Please allow 4-6 weeks to complete your figurines, since there are many steps to go through from 2D drafts to 3D figurine. Want to know how will you be served? Please check our Service Porcess.